Not to be confused with World 7-3. Area 7-3 is the third course of Cannon Cove and the fifty-seventh course overall in Mario vs. Donkey Kong: Mini-Land Mayhem!. The Mini Marios begin at the bottom center, with the exit door near the top center. In order to reach it, they must simply be guided via a series of Cannons and Purple Conveyors to it. The M-Token is located at the bottom right, near some Spike Traps. To collect it, the Mini Marios must simply use the Cannon on a track closest to it and fire right in the middle of the track while making sure a Purple Conveyor is placed atop it. 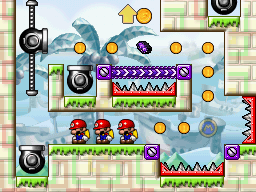 The Mini Mario Card is located near the top left, to the left of the exit door. The Mini Marios must fire from the Cannon at the top of its track, then ride a sloped left-facing Purple Conveyor in order to reach it. In Plus Mode, the Mini Toad must be guided to the exit door first, followed by the two Mini Donkey Kongs.